With the arrival of Western ships, new plants and animals soon found their way to the Hawaiian Islands. The simple‐seeming gift of a few cattle given to Kamehameha I by Captain George Vancouver in 1793 made a major impact on the Hawai`i’s economy and ecosystem. It also spawned a rich tradition of cowboy and ranch culture that is still here today. Spaniards introduced the first cattle to Veracruz, Mexico in 1521. Vancouver picked up descendants of these animals from the Spanish mission in Monterey, California when he set off across the Pacific, intending to use them as food and gifts. Cattle were not the only animals introduced to Hawai`i during this period. In 1778, Captain Cook left both goats and pigs. British introduced sheep in the 1790s and they all soon roamed on Mauna Kea and Hualālai. In 1803, American Richard Cleveland presented horses ‐ a stallion and a mare ‐ to Kamehameha. When Vancouver landed additional cattle at Kealakekua in 1794, he strongly encouraged Kamehameha to place a 10‐year kapu on them to allow the herd to grow. In the decades that followed, cattle flourished and turned into a dangerous nuisance. By 1846, 25,000-wild cattle roamed at will and an additional 10,000-semi‐domesticated cattle lived alongside humans. A wild bull or cow could weigh 1,200 to 1,500-pounds and had a six‐foot horn spread. Vast herds destroyed natives’ crops, ate the thatching on houses, and hurt, attacked and sometimes killed people. Hunting sometimes ended in inadvertent tragedy. In 1834, the trampled dead body of Scottish botanist David Douglas, for whom the Douglas Fir tree is named, was discovered in a cattle-trap pit on Mauna Kea. Cattle ranching remains an important export and food industry in Hawai‘i. The total number of cattle and calves on Hawai‘i’s ranches as of January 1, 2012 was estimated at 140,000-head, roaming nearly 750,000-acres of pasture land. After bottle-feeding him and briefly pasturing him, he ditched the premises and hooked up with part of the Parker Ranch herd. 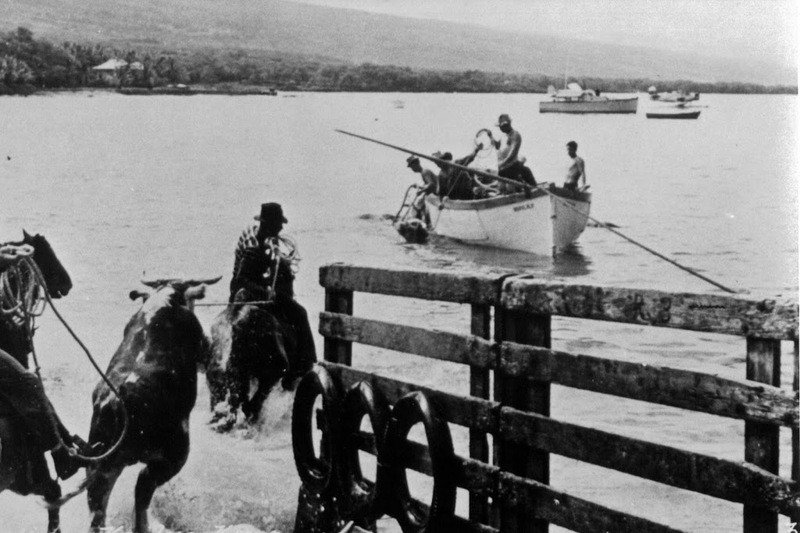 The image shows them swimming cattle to a transport boat, farther out in the bay. In addition, I have included some other images of cattle transport using this similar technique in a folder of like name in the Photos section of my Facebook page.